It's fair to say 3am may seem like a crazy time to be on the road, but the Bootleg team had a boat to catch … in Albany. The pre-dawn, four-and-a-half hour drive across the Great Southern saw them arrive at Wilson Brewing just time to collect 2,000 Akoya oysters from the cool waters surrounding Mistaken Island in King George Sound. Oysters collected and Pizey’s stomach re-alignment from the boat trip complete, the molluscs, shell and all, were added to a 3,000 litre batch. A late mash addition of roasted wheat and barley blackened the beer and provided the slightest amount of roasted character, one somewhat echoed by the Akoya oysters' natural flavour. 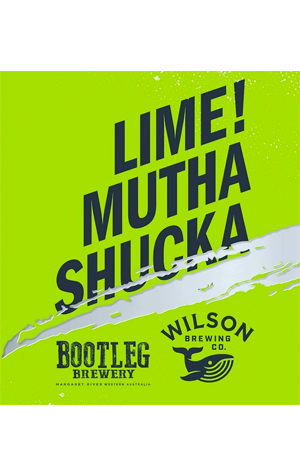 Forty kilograms of local limes were then hand peeled, bagged and added to the whirlpool with 20 litres of juice added about 80 percent of the way through fermentation. Complimenting the strong lime flavour, Citra, Galaxy and Amarillo hops were used sparingly to maintain the fine briny/citrus/roast balance in what's up there as one of the most intriguing WA beers this year. Warning: Lime! Muthashuka has a Shellfish Food Allergy Warning.